Feel like stompin’ to some funk? Here’s a cool 3 track CD single from Sweden with the really nice band SAY WHAT. They had released one vinyl single prior to this in 1990 and stepped into digital format here. At this point they were a 9-piece with Stefan Woldekidan - Lead Vocals, Mathias Karlsson – Bass, Sture Kaveús – Guitar, Joakim Rudén – Keyboard, Andreas Danielsson – Percussion, Hans Blomqvist – Drums, Johan Håkasson - Saxophone, Thérèse Löf Amberg - Backing vocals, Therese Andersson - Backing Vocals. Not bad, eh? Musicwise we are talking funky rock/pop and soul vibes, so anyone into TOWER OF POWER, JAMES BROWN and the more funky songs that MICHAEL RUFF used to perform live with THE STRAITJACKETS will love this. The band’s own common influences were for example CAMEO, ZAPP, EARTH WIND & FIRE and LEVEL 42. Band leader Stefan personally thought they had a clear KOOL & THE GANG vibe, too. So imagine all this in a lovely mix and you know where we’re getting at. The opener “How could you do it” is a proof of how solid the rhythm section was (and probably still is), and has kind of a LEVEL 42 typish bass playing and a certain funky rhythm guitar playing. Swedish artist ERIC GADD sometimes comes in this direction with his music, actually, but this is better. “On my mind” is almost even more funky, with lots of soul and rock. The song would have needed more variation, but apart from that it is great. 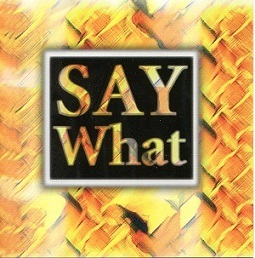 “Say what” finishes off this 3-track single, following the tradition of the other two songs. It also needs to be mentioned such a difference it makes with a sax player in a band! Horns really spice things up, and I can truly recommend this item to all you fans of funky music. This single is not super rare; I stumble across approximately one copy each year on the second hand market in Stockholm.